People's monitor of prisons in Europe, gives prisoners an amplifier for their voice. Sébastien van Malleghem has been awarded the 2015 Lucas Dolega Award forPrisons his four years (2011-2014) of reportage from within the Belgian prison system. 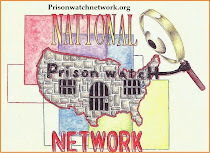 Nevada Prison Watch has moved! - Dear Visitor, We have moved this blog over to Wordpress and you can find it by going to Nevadaprisonwatch.org or Nevadaprisonwatch.wordpress.com. Thank you!